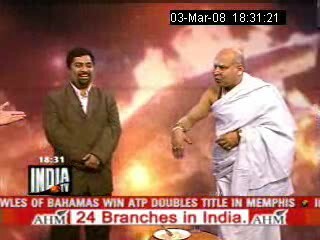 On 3 March 2008, Sanal Edamaruku, who is the president of an organization called Rationalist International, challenged India’s tantrik (a black magician). The tantrik is thought to be the most powerful in India. Sanal has challenged the tantrik to kill him using black magic during a live TV program. The tantrik, Pandit Surinder Sharma, agreed. Sharma claimed during an earlier TV discussion that he could kill any person within 3 minutes using black magic. This has started because one of India’s former politicians, Uma Bharati, accused her opponents of using tantrik magic to hurt her, following a series of negative events in her life. During the challenged, the tantrik chanted his mantras for a lot more than 3 minutes but it had no ill effect on Sanal whatsoever. In fact, Sanal Edamaruku only laughed all the time. The tantrik moved onto more “powerful” techniques and started to wave a knife and touch Sanal with it. Only after two hours of this show, which overrun all other programs at that time on the channel, did the anchor declare the failure of the tantrik. The latter tried to explain it away with the thought that a very powerful god was guarding Sanal, to which he replied being an atheist. The tantrik then said that his most powerful magic works only at night. Sanal has challenged him again. Under an open might sky several hours later they gathered for the ritual. The tantrik warned that once it is started there’s no way back and Sanal would get crazy and then scram in pain and die. Sanal laughed and they started. The tantrik chanted his mantras again, threw ingredients into the fire, wrote Sanal’s name on a sheet of paper, torn it and threw into the flames. But nothing happened to Sanal horizontal only kept smiling. The tantrik then continued to his most powerful magic. He powdered a clod of dough with mysterious ingredients, had Sanal touch it, then cut it with a knife and threw into the fire. Sanal should have died at that moment. Instead he only laughed and a minute later the challenge was closed. Millions of people watching the program were relieved and they saw the Tantra powers failing. The psychological attack did not work on the president of the Rationalist International. Obviously, the entire television “debunking” is a farce. You can hear the suppressed snickering in the voice of the fat man masquerading as a sadhu. I am appalled with the fact that anyone can even think about abusing some of the gifts to harm, let alone to kill any living being. So, I do consider that almighty God had helped us in this case, bad things to fail. As far as the “rationalist’s” statement about being an atheist , I do believe that he may be not practicing religion, but no one could possibly be an atheist, because the structure of our mind contains a homo religiosus as well, and it can not be removed by our will. I strongly support the above statement that a real black magic is a destructive believes.